Unlike so many New York landmarks the Strand Book Store, with its miles and miles of used, old, antiquarian books has survived. It's been featured in films, TV serials, novels and short stories. It's brought luck to lots of its customers, like a friend of mine still happily married to a man she met there many years ago. And now, a visit to the Strand some ten years ago has propelled stand-up comics Nick Kroll and John Mulaney all the way to Broadway. Something about a typical forever-in-New York 70-something pair Kroll and Mulaney spotted buying a copy of Alan Alda's memoir, Never Have Your Dog Stuffed struck their always primed for inspiration funny bones. And so Gil Faizon and George St. Geegland were born. They started to do their shtick as these two, often outrageously opinionated alte kakkers, one an actor and the other a novelist and playwright. Over the years their fan base grew via Comedy Central. 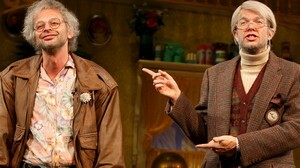 And it's the silver-haired Gil and George who are the stars of Oh, Hello at the Lyceum. Kroll and Mulaney have tested and refined the show on the road and at a brief off-off Broadway run at the Cherry Lane Theater. The On Broadway sub-title indicate an awareness that what fits perfectly in a downtown theater may not have enough play-like depth for an elegant old venue like the Lyceum. And so, to answer the question as to whether this comic duo's characters do indeed have the stage legs to warrant a Broadway production, it's Yes. . .sort of. For Kroll and Mulaney's many fans Oh, Hello is a winner. They'll buy into the sort-of play structure as a combination memoir of a 50-year friendship and tribute to the theater. If the jokes overshadow the plot, that will suit them just fine. Who doesn't enjoy a good non-stop laugh fest. Thanks to Comedy Central, it's even likely to attract a good many visiting fans who'll find enough to laugh at, even if they don't get the hailstorm of theatrical and strictly New York references. Anyone who, like me, comes to the Lyceum as Kroll-Mulaney virgins will have a harder time getting into their brand of whacky, often in your face humor. Still, the very genuine chemistry between these guys does give a dash of charm to their shtick-y trajectory through years of living and kvetching together. Their brash and tireless visits to the world of the late 70s and onward, their often politically incorrect commentary on fellow New Yorkers, plays, players and playwrights are funny enough to win them plenty of new admirers. Even when the jokes didn't always have me shaking with laughter like most of the people around me, I couldn't help being impressed by Kroll and Mulaney's boundless energy and the way they manage to give an improvisational feel to what is for the most part carefully scripted. While I thought Gil and George were at their funniest when they were in front of the curtain doing their own opening act, director Alex Timbers and his crafts team contribute mightily to giving all the lunacy that follows a fluid and colorful production that's a cross between the old Nichols and May improv and even older commedia dell'árte style comedies. When the curtain opens, the scene created by Scott Pask that greets us is definitely Broadway. The ways our stars describe it though, it's a budget set, put together with found materials from other shows. The setting is 73rd Street on Manhattan's Upper West Side (which according to George is "the coffee breath of neighborhoods"). At stage left we have the front steps to the pair's 5-bedroom rent-controlled apartment (a letter from their landlord announcing a rent hike from $75 to $2500 a month is a major plot point). That stoop is from the Bill Cosby Show (obviously intended to elicit a big yuk), and a pair of beauty parlor chairs up stage had a former life as set pieces in Steel Magnolias. Overarching everything is a Manhattan high rise skyscape, featuring with towers similar to the famous Dakota Apartments. The least tightly scripted skit — oops, I mean scene, as in a play — takes our septuagenarians to a typical New York diner where "even ice cream is bad. . .. everyone is ugly . . an the menu is like, 34 pages long, and even has lobster on it." This zeroes in on a rather tiresome gag about an oversized tuna sandwich that brings a different guest on stage for each performance to share the chit-chat and, what else, a giant tuna sandwich. The guest at my performance was singer Josh Groban, who like Kroll and Mulaney is making his Broadway debut in Natasha, Pierre & The Great Comet Of 1812. Groban actually gave us a teensy sample of his singing before exiting the stage. But while George and Gil never sing, their very active performance includes a dream ballet with spectacular nightmare effects by Basil Twist that also showcase the work of lighting designer Jake DeGroot. I can't say that Oh, Hello ever quite escaped its improv-sketch comedy roots for me. And I'll admit that even at 90 minutes it felt long. Ultimately, Messrs. Kroll and Mulaney's chief accomplishment is is that by stepping into the personas of these old geezers they've managed to bridge the gap between twenty to forty year-olds and the naturally cotton haired audiences. Finally, a word about John Slattery and John Hamm who are listed as understudies in the program. I feel fairly safe to tell readers not to expect them to ever take the stage— at least not as George and Gil. However, I feel just as safe to suspect that they'll show up as guests for some jokey interchanges about being understudies in one or more of those Tuna episodes, perhaps even together. Approximate running time: 90 minutes. From 9/23/16; opening 10/10/16; closing 1/18/17.